The suppressor of cytokine signaling (SOCS) family of proteins are inhibitors of the cytokine-activated Janus kinase/signal transducers and activators of transcription (JAK/STAT) signaling pathway. We aimed at evaluation of expression of SOCS genes in breast cancer. We evaluated expression of SOCS1–3 and SOCS5 genes in breast cancer samples compared with the corresponding adjacent non-cancerous tissues (ANCTs). All assessed SOCS genes were significantly downregulated in tumoral tissues compared with ANCTs. SOCS1 and SOCS2 genes were significantly overexpressed in higher grade samples, but SOCS3 had the opposite trend. 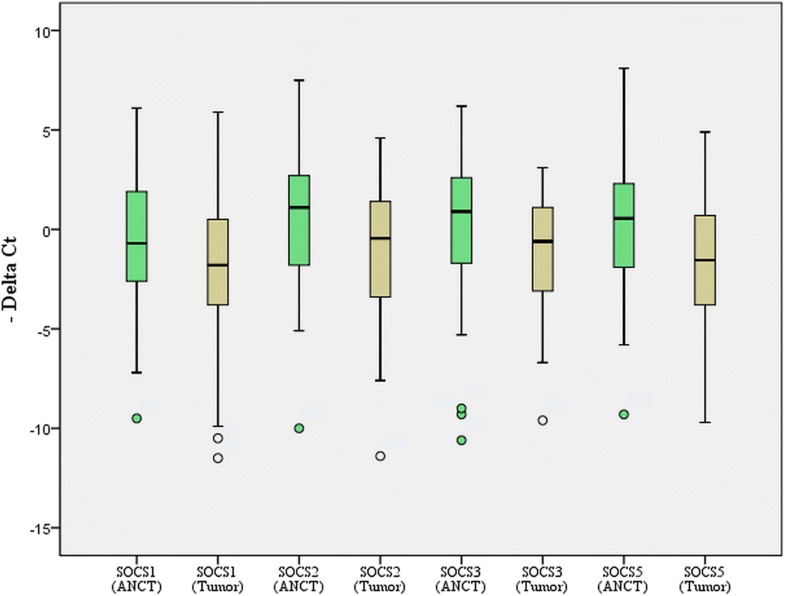 Significant correlations were found between expression levels of SOCS genes. 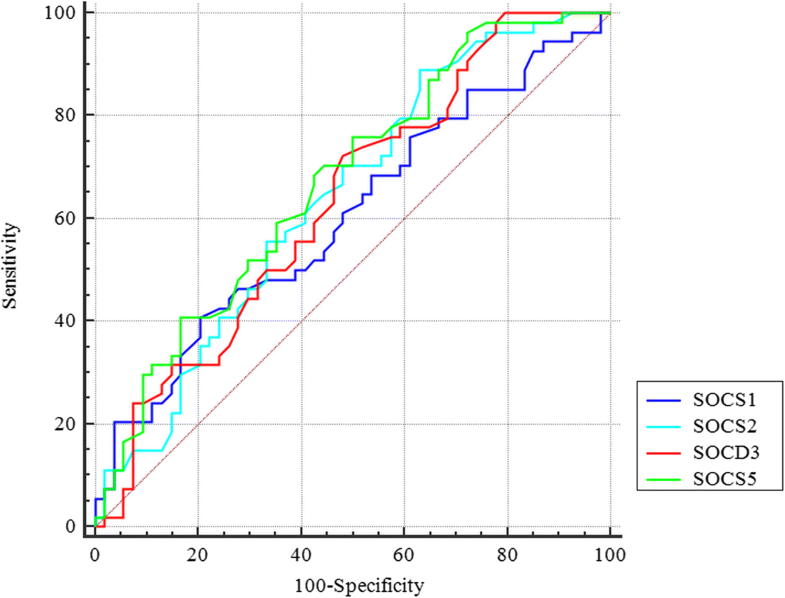 The SOCS1 and SOCS2 expression levels had the best specificity and sensitivity values respectively for breast cancer diagnosis. The current study provides further evidence for contribution of SOCS genes in breast cancer. The suppressor of cytokine signaling (SOCS) family of proteins have been recognized as potent inhibitors of the cytokine-activated Janus kinase/signal transducers and activators of transcription (JAK/STAT) signaling pathway through which they also suppress cytokine signal transduction . Apart from their role in the regulation of immune responses, tumor suppressor functions have been demonstrated for certain members of this family in various tissues. For instance, SOCS1 impedes proliferation signals relayed by several oncogenes in the hematopoietic lineage  and hepatic tissue . Moreover, hypermethylation of SOCS1 promoter has been shown in hepatocellular carcinoma , cervical cancer , and ovarian and breast cancer cells . Such data implies that aberrant downregulation of SOCS genes might participate in the development of breast cancer as well. However, Evans et al. have shown upregulation of several members of SOCS family in MCF-7 and HCC1937, two cell lines that are regarded as prototypic breast cancer cell types. Moreover, they have demonstrated responsiveness of SOCS1 and SOCS3 promoters to regulation by cytokine or growth factor signals in spite of hypermethylation state of these promoters in these two cell lines . Sutherland et al. have reported the inhibitory role of SOCS1 and SOCS2 but not SOCS3 on the growth of breast cancer cells and suggested hypermethylation of these genes as a mechanism for intensifying cytokine responsiveness and tumorigenesis process in breast tissue . However, considering the difference in the expression of microenvironment-related genes in cancer cell lines and clinical samples, the data regarding expression pattern of SOCS genes in cell lines can be hardly adopted for clinical samples. The results of expression analysis of SOCS genes in clinical samples are inconsistent. Although Sasi et al. reported higher expression of SOCS1 mRNA in breast tumor samples obtained from patients with earlier tumor stage and better survival , Raccurt et al. demonstrated constant higher expression of SOCS1–3 in tumor cells compared with normal adjacent epithelial and connective tissues . Consistent with the results of the former study, expression of SOCS1 protein in breast cancer tissues has been associated with lower risk of identification of circulating tumor cells in the peripheral blood . Based on the importance of SOCS-based strategies in treatment of cancer , assessment of expression of SOCS genes in clinical samples obtained from breast cancer patients is of practical value. Consequently, we designed the current study to evaluate the expression of SOCS1–3 and SOCS5 genes in invasive ductal carcinoma of the breast compared with the corresponding adjacent non-cancerous tissues (ANCTs). Fifty-four patients with definite diagnosis of invasive ductal carcinoma of the breast participated in the study. The inclusion criteria were histopathological confirmation of invasive ductal carcinoma and availability of clinical data. Patients with other types of breast cancer and familial breast cancer and those who received prior chemo/radiotherapy were excluded from the study. The research protocol was approved by the ethical committee of Shahid Beheshti University of Medical Sciences. All methods were performed in accordance with the relevant guidelines and regulations. Informed written consent was obtained from all patients. Tumoral tissues and ANCTs were excised from all patients during surgery in Sina and Farmanieh hospitals. All tissue samples were transferred in liquid nitrogen to the genetic laboratory and stored in − 80 °C until gene expression experiments. Medical records of patients were assessed, and the relevant data was collected for correlation analysis. Relative expressions of SOCS genes were assessed in tumoral tissues and ANCTs using quantitative real-time PCR technique. Briefly, total RNA was extracted from tissue samples using TRIzol™ Reagent (Invitrogen, Carlsbad, CA, USA), and cDNA was synthesized by using RevertAid First Strand cDNA Synthesis Kit (TaKaRa, Japan). TaqMan Fast Universal PCR Master Mix (Applied Biosystems, Foster City, USA) was used for expression analysis of genes. Expressions of genes were normalized to expression of hypoxanthine-guanine phosphoribosyl transferase (HPRT). The nucleotide sequences of primers are shown in Table 1. All experiments were performed in duplicate in the rotor gene 6000 Corbett Real-Time PCR System. ER/PR status was acquired from patients’ medical histories which were performed by immunohistochemical (IHC) staining. Staining of ≥ 5% of tumor cell nuclei was described as positive, while staining of lower percentages was reported as negative. HER2/neu results were acquired from the medical reports of patient and were performed by IHC. Results of 0 to 2+ were regarded as negative and 3+ was considered as positive. Ki-67 status was assessed using IHC assays with the anti-human Ki-67 monoclonal antibody MIB1. The percentage of positively stained malignant cells among the total number of malignant cells was calculated. The results were reported as positive vs. negative. Student’s paired and unpaired t tests were used for analysis of differences in gene expression between paired and unpaired samples. The association between clinicopathological data and transcript levels of each gene was assessed using the chi-square test. Tukey’s honest significance test was used to find the difference between mean values of transcript levels between different groups. The expression fold change was measured using the efficiency corrected calculation models. The pairwise correlation between relative transcripts levels of genes was measured using the regression model. For all statistical tests, the level of significance was set at P < 0.05. The receiver operating characteristic (ROC) curve was plotted to evaluate the rightness of gene expression levels for differentiating tumoral vs. ANCTs. In order to evaluate gene expression probability cutoff, the Youden index (j) was used to maximize the difference between sensitivity (true-positive rate) and 1—specificity (false-positive rate). The precision of each marker for diagnosis of malignancy status was scored based on the area under curve (AUC) values using the following assumption: 0.90–1 = excellent (A), 0.80–0.90 = good (B), 0.70–0.80 = fair (C), 0.60–0.70 = poor (D), and 0.50–0.60 = fail (F). General demographic data of patients are shown in Table 2. All assessed SOCS genes were significantly downregulated when comparing total tumoral tissues with total ANCTs (SOCS1: expression ratio = 0.47, P = 0.033; SOCS2: expression ratio = 0.38, P = 0.008; SOCS3: expression ratio = 0.47, P = 0.027; and SOCS5: expression ratio = 0.35, P = 0.001). Figure 1 shows relative expression of SOCS genes in tumoral tissues and ANCTs. We compared the expression level of each gene in each tumoral tissue vs. its corresponding ANCT and categorized patients based on these values to upregulation and downregulation groups. Next, we assessed associations between clinicopathological data and relative expressions of genes. No significant associations were found between the relative expression of genes in tumoral tissues and the ANCTs and patients’ clinicopathological data. Table 3 shows the results of association analysis between relative expressions of genes in tumoral tissues and ANCTs and patients’ clinicopathological data. Moreover, we compared relative expression of each gene in tumoral samples between clinicopathological-based categories (Table 4). SOCS1 and SOCS2 genes were significantly overexpressed in grade 2 samples compared with grade 1 samples (P values of 0.004 and 0.04 respectively), but SOCS3 had the opposite trend (P = 0.01). 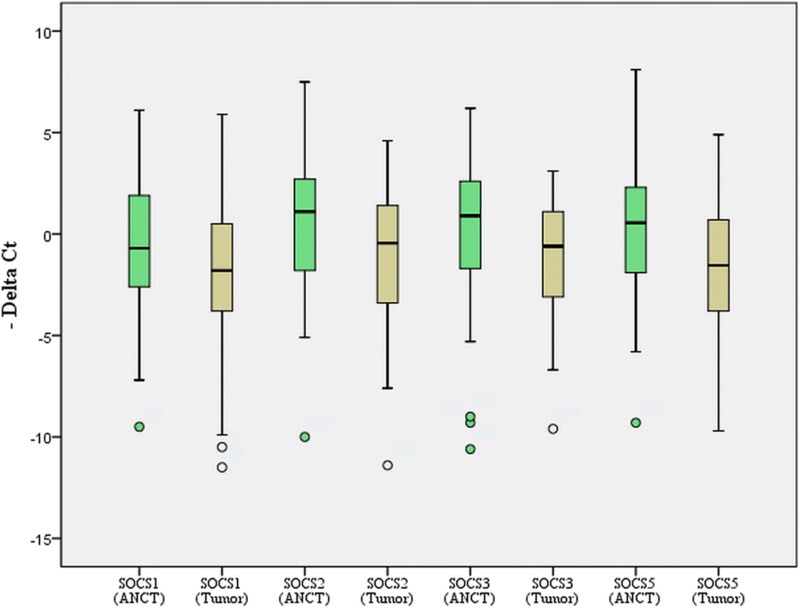 Moreover, expressions of SOCS1 and SOCS2 genes were significantly higher in grade 3 samples compared with grade 1 samples (P values of 0.007 and 0.05 respectively). No significant difference was found in expressions of other genes between other clinicopathological-based categories. We evaluated correlations between expression levels of genes in both tumoral tissues and ANCTs. Significant correlations were found between expression of SOCS genes both in ANCTs and in tumoral tissues except for lack of correlation between SOCS2 and SOCS5 in tumoral tissues (Table 5). We also assessed the correlation between expression of genes and patients’ age and tumor grade after controlling the effects of each variable. After controlling the effects of confounding factors, no significant correlation was found between expression of genes and patients’ age or tumor grade (Table 6). Based on the ROC curve analysis results, the SOCS1 and SOCS2 expression levels had the best specificity and sensitivity values respectively for breast cancer diagnosis (Fig. 2). Combination of transcript levels of all SOCS genes improved the AUC value, but such value did not reach the acceptable threshold. Table 7 shows the details of ROC curve analysis. SOCS proteins potently regulate the intensity and extent of STAT signals. Absence of SOCS functions would lead to constitutive expression of STAT pathways which in turn triggers cellular transformation, tumor cell invasion, and metastasis . STAT proteins have established role in the development of breast cancer. Downregulation of STAT3 and STAT5a/b has been suggested as a mechanism for anti-proliferative effects of some anti-cancer agents in breast cancer cells . In the present study, we demonstrated significant downregulation of SOCS1–3 and SOCS5 genes in breast cancer tissues compared with ANCTs which is in line with the previous findings regarding the role of SOCS proteins in the regulation of STAT proteins and the contribution of STATs in the pathogenesis of breast cancer. Downregulation of SOCS1 has been demonstrated in numerous malignancies such as prostate cancer, hepatocellular carcinoma, laryngeal carcinoma, multiple myeloma, acute myeloid leukemia, pancreatic cancer, and lymphoma . However, the results of previous studies regarding expression of SOCS genes in breast cancer are inconsistent. Raccurt et al. have previously assessed the expression of SOCS1–3 genes in 17 breast carcinomas, 3 ANCTs, and 10 breast cancer lines and demonstrated higher expression of SOCS1–3 proteins within in situ ductal carcinomas and infiltrating ductal carcinomas compared with normal breast samples. In situ hybridization also confirmed overexpression of SOCS1–3 transcripts in both tumor tissue and reactive stroma. They suggested that such overexpression might reflect the host/tumor response or be induced secondary to autocrine/paracrine release of growth hormone and prolactin . The inconsistency between our results and Raccurt et al. study can be explained by the low number of samples in their study. As we demonstrated in our study, expressions of SOCS genes do not follow a similar pattern in all patients. For instance, while SOCS1 was downregulated in about two third of breast cancer tissues compared with the corresponding ANCTs, it was upregulated in the remaining samples. This was also true for other SOCS genes. Contrary to Raccurt et al., Sasi et al. have assessed expression of SOCS1–7 transcript levels in 127 breast cancer tissues and 31 ANCTs using real-time PCR and reported no significant difference in their expression between tumoral tissues and ANCTs . Failure to find difference in expression levels of genes between tumoral tissues and ANCTs might be due to dissimilar number of samples in each group. However, they found inverse association between SOCS1, 4, 5, 6, and SOCS7 expressions and TNM stage. Notably, they reported significant associations between higher levels of certain SOCS genes and disease-free or overall survival . Our results regarding global downregulation of SOCS2 in tumoral samples compared with ANCTs are in line with Farabegoli et al. study which demonstrated a role for SOCS2 downregulation in the enhancement of cell proliferation and tumor growth in breast cancer . They also demonstrated positive association between SOCS2 protein expression and low grade, low nuclear grade, and p27 protein  which is not consistent with our results. Haffner et al. also demonstrated favorable prognostic value of high SOCS2 expression in primary breast tumors . We hypothesize that SOCS downregulation in breast cancer samples as revealed in our study might result in constitutive expression of STAT pathways. Higher expression of STAT genes might contribute to several aspects of tumorigenesis such as cellular transformation, invasion, and metastasis. Alternatively, based on the reported role of SOCS proteins in inhibition of mutant Jak2 and suppression of cytokine-independent signaling , downregulation of SOCS genes in breast cancer tissues may trigger some cytokine-independent pathways resulting in cell transformation. Although we did not find any association between expression of SOCS genes and TNM stage, we found higher levels of SOCS1 and SOCS2 genes in grade 2 and 3 samples compared with grade 1 samples but lower levels of SOCS3 in grade 1 samples compared with grade 2 samples. Sasi et al. have previously shown downregulation of SOCS7 expression in higher tumor grades . The observed differences in expression of SOCS genes between different pathological grades might reflect specific roles of SOCS genes in certain grades of malignancy. One might classify SOCS genes to certain groups based on their relative expression in different grades of breast cancer. However, future studies are needed to clarify the practical significance of such observation. The reported downregulation of SOCS3 in our study is in line with the Barclay et al. study which demonstrated the antiproliferative role of this gene via inhibition of STAT3 expression and suppression of STAT5 phosphorylation in breast cancer cells . We also demonstrated significant downregulation of SOCS5 in tumoral tissues compared with ANCTs. Kario et al. have previously shown overexpression of SOCS5 in cells following treatment with epidermal growth factor (EGF). They also reported the effect of SOCS5 on downregulation of epidermal growth factor receptor (EGFR) expression through enhancement of EGFR degradation . Considering the role of EGFR and its downstream pathway in regulation of epithelial-mesenchymal transition, migration, and tumor invasion in breast cancer and the availability of drugs that target this pathway , alterations in the expression of SOCS5 in breast cancer might be involved in the response of patients to such targeted therapies. The observed downregulation of SOCS genes in breast cancer tissues compared with ANCTs might be due to either epigenetic or genetic changes. Sutherland et al. have reported SOCS1 promoter hypermethylation in 9% of breast cancer samples . On the other hand, deleterious SOCS1 mutations have been detected in both primary mediastinal B-cell lymphoma and classical Hodgkin lymphoma . Considering the role of growth hormone and prolactin in regulation of SOCS genes expression [8, 17], any change in the secretion of these hormones in the tumor microenvironment might also alter SOCS expression. We also demonstrated significant correlations between expression of SOCS genes both in ANCTs and in tumoral tissues except for lack of correlation between SOCS2 and SOCS5 in tumoral tissues which suggest the presence of a similar regulatory mechanism for their expression. In spite of significant difference in expression levels of SOCS genes between tumoral tissues and ANCTs, none of SOCS genes had adequate sensitivity and specificity to be used as a diagnostic biomarker. Taken together, in spite of frequently reported alterations of SOCS genes in human malignancies, the data regarding expression of these genes in breast cancer is inconclusive which necessitates design of further studies with larger sample sizes to elaborate their function in this type of human cancer. MT and SG-F supervised the study. IA performed the laboratory assessment. VKO analyzed the data. All authors read and approved the final manuscript.